A-CLASS CARPET CLEANING, INC. IS AVAILABLE 24 HOURS A DAY to respond to water damage clean-up calls at your home or place of business. We will respond as fast as possible. We handle insurance claims and work in full cooperation with insurance adjusters to reduce damage to a minimum and save the inconvenience to home and business owners and reduce claim volume. Our company is certified by the IICRC for Water Damage Treatment and Restoration. If water damage is left untreated—even for a short period of time—water contamination spreads rapidly to unaffected areas, increasing cost dramatically. Furniture in direct contact with water de-laminates and swells, finishes crack, and legs split. Colonies of mildew begin to grow along with musty odour. Advanced mildew growth destroys organic materials. Serious health problems may arise, including hypersensitivity, pneumonitis, aspergillosis, asthma and various allergies. Moisture sensitive components in pianos and organs begin to warp. Metal surfaces start to rust. Structural parts of buildings swell and buckle. We’ll arrive quickly anywhere in the GTA and assess the situation. 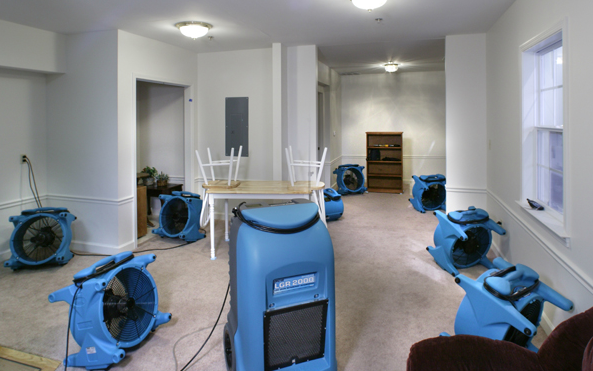 A-Class Carpet Cleaning, Inc. has trained Water Damage Restoration Technicians (IICRC) ready to help. We’ll locate the leak(s), help remove your valuables, extract the water using our portable machines, bring in professional drying and dehumidifying equipment to remove all moisture damage, ensure proper sanitation by applying safe, green antibacterial and anti-odour solutions to combat mildew, and continue to monitor the situation daily so your home or office will be completely dry and mould-free efficiently and safely. Call us anytime: (416) 230-0501.